Andy Peaks hailed the “tremendous spirit” within the AFC Rushden & Diamonds squad after they claimed their fifth Evo-Stik South League East win in a row to remain top of the table. Diamonds scored twice in the last 18 minutes as goals from Ryan Robbins and Ben Farrell secured a 2-0 success over 10-man Hartley Wintney at Hayden Road. The win also saw Peaks’ side claim a fourth successive clean sheet as they stayed at the summit on goal difference from AFC Dunstable. And the Diamonds boss was unable to contain his delight. “We are in a really good groove at the moment,” he said. 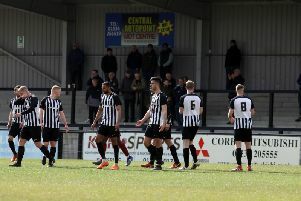 “Even when we had a couple of disappointing results like the 0-0 draws with Arlesey and Egham, the performances were still good. “We have a strong squad who are working hard for each other and there is a tremendous spirit in the dressing-room. “We are picking up good results against teams at the top and that is something we have struggled with in the past. This was the sort of game that we would have lost last season. “We aren’t giving goals away and I have said all along that this group would be capable of going on a good run of winning matches. Peaks described Hartley as “one of the best sides we have played” after a hard-fought encounter. The visitors were reduced to 10 men on the hour when Steve Noakes was sent-off for bringing Tom Lorraine down when he went through on goal. And Diamonds made them pay. “I think they are certainly one of the best sides we have played,” the Diamonds boss added. “We were not great in the first half, we were okay. But in the second half we were much better and by the end, I thought we deserved it. “The conversation at half-time was based around the fact that we aren’t just going to roll teams over. It was about being patient and sticking to what we believe in. Diamonds are back in action on Wednesday night when they head to Aylesbury United.